I wrote this article in the early 90's for the 25th Anniversary Event Program, honoring Bob Beamon for the Greatest Track & Field Feat in Olympic History. (Mexico City, 1968) Its message still resonates today. Sometimes when I get home after a particularly hectic day, I'll put on some jazz and take out my African drums to strike up a beat. As I close my eyes, my body succumbs to the rhythmic vibrations of pounding drums. With the stress of the day draining off, I kick back and try to reflect on where I've been and where I'm going. Sometimes my mind wanders back to Mexico City and 1968; but mostly, I think about today and tomorrow, one day at a time. I work up a good beat and follow the flow. This morning, I went to an elementary school to talk with a few hundred children about precious opportunities. The kids cheered when I showed a replay of the jump. That got their attention. But then one kid laughed when I confided that I couldn't read a book at his age. He didn't mean anything by it, but it's hard to know sometimes who listens closely to the lessons of the past - who we can reach and who remains lost in America's school corridors and neighborhood back alleys. As a kid growing up in Jamaica, Queens, I could barely find a positive role model in the neighborhood. The money and fancy clothes flashed around by local drug dealers and pimps were tempting and offered a quick way out. The message of sacrifice offered by parents, guardians and teachers who toil anonymously in the trenches was brushed aside to satisfy the appetite of the moment. When a young man today wonders if he'll live to see his twenty-fifth birthday and our babies are having babies, it's easy to identify such an overwhelming sense of resignation on our nation's street corners. The statistics are mind blowing. Nationwide, an estimated 270,000 firearms are brought to our kids' schools every day. While a recent United Way survey identified that non-profit groups reach out to an estimated 15,000 "at-risk" youth in Dade County, Florida, another 120,000 needy kids aren't getting proper attention. Let's get one thing straight - in some way, all of our youth are at risk. Before we can isolate what makes children tick, their parents must first discover what makes themselves function effectively. Before parents can instill a sense of pride and dignity in a child, before we can talk about molding model citizens, mothers and fathers must feel good about who they are. A stable home life is the first priority our country must address before we can consider the active role that athletes can play in developing healthy minds and bodies. Obviously, each kid is not going to cross the finish line first, but as Baron Pierre de Courbertin of France (the inspiration behind holding the modern Olympic Games) stated: "The important thing in the Olympic Games is not to win but to take part; the important thing in life is not the triumph but the struggle. " Ultimately, the lesson for our youth to gather is that it is not imperative to take home the gold medal. Champions are not made on the field or track; champions are made according to your accomplishments and abilities in every day life situations. The same tools that I used to succeed athletically can be applied to succeeding personally. Just as practice in long jumping made me successful, practice in whatever your profession or hobby may be will make you equally as successful. A sound work ethic will offer a framework for a youth's self-worth and the impetus to stand up and scream: "I am a Champion!" One key to my athletic accomplishments, however, is that someone was eventually there to give me an opportunity. 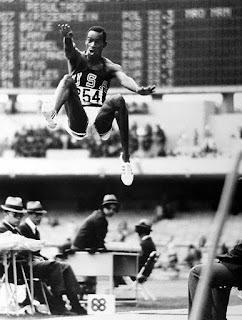 Whether it was Larry Ellis, my high school track and field coach, or Ralph Boston, Mr. Long Jump, a helping hand guided me to focus out distractions and concentrate on honing my skills. While an Olympic jump gave me notoriety and stature, that success does not define who I am. But sports did give me a backdrop of discipline to apply each day. This stable force helps me to face the realities of keeping up with today's rigors. Our children must be taught such lessons from sports - how to set realistic goals, stick to them, work through them and redefine them to stretch their talents to new heights. Because as the image of an eternal Olympic torch burns an indelible message of hope and respect in our hearts and minds, the flame is beginning to flicker. The fire in our neighborhood streets is simply suffocating the spirit and dreams of every kid who is taken for granted and not given an opportunity to flourish. The great news is that high profile athletes are anxious to offer their time to find solutions. From Nate Archibald in Harlem to James Worthy in Compton and everyone in between the two coasts, athletes are coming to the rescue of young people in vast numbers. The simple point is that we have the ability to attract a kid's attention. Let's use our gifts constructively. The boys and girls growing up in America are the wind beneath my wings. They are my motivation for rising each morning with an inspired outlook. So tonight, my eyes are open as I allow the drum beat to guide my thoughts about yesterday and today. About Mexico City. About some anonymous kids marking time by hanging out on the corner. About tomorrow's journey. My beat is strong and fluid now, yet it seeks interpretation and clarity. It reaches out for your understanding and support. The beat goes on. It simply has to. 1994 Bio: Perry Zane Binder is a sports radio talk show host on WSBH in Miami Beach (Love of the Game).